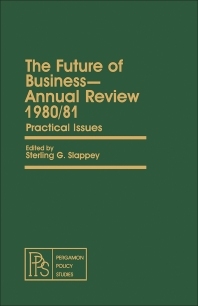 The Future of Business—Annual Review 1980/81: Practical Issues is comprised of five essays that examine the opportunities and problems facing business, and their relation to society. The five essays are entitled ""The World of Work Gets Wider and Wilder,"" ""Business Has Failed to Explain Itself,"" ""Changing Demographics and How They Affect the Future of Business,"" ""The Future of Multinational Business,"" and ""Are Material Resources a Restraint on Economic Growth?"" Gus Tyler's ""The World of Work Gets Wider and Wilder"" examines the make-up of the constantly expanding work forces of the past. George Hammond's ""Business Has Failed to Explain Itself"" looks 200 years back to the start of modern commercialism and to the Industrial Revolution. Lawrence Franko's ""The Future of Multinational Business"" takes a substantive look at both American and non-American multinationals. James Hyatt's ""Changing Demographics and How They Affect the Future of Business"" looks at demographic factors involving business. Lastly, Professor Beckerman's ""Are Material Resources a Restraint on Economic Growth?"" describes why avaricious human beings will continue to eat, build, and multiply. He questions the prophecies of Thomas Malthus by asserting ""...we are not going to starve to death anytime soon."" This book will be useful for readers with interests in the exciting problems addressed by the five essays. 5 Are Material Resources A Restraint On Economic Growth?